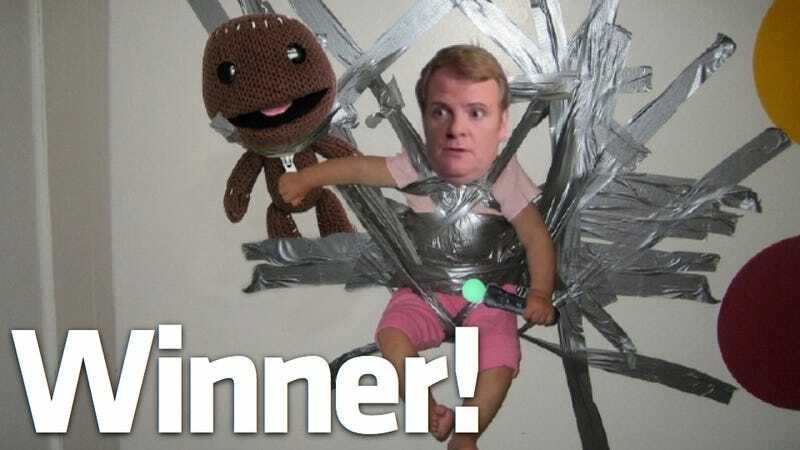 Some snippiness from Sony's CEO provided the grist for last week's 'Shop Contest challenge, in which we explored the challenges of child rearing by those who gave us the PSP. We've got 20 hot and fresh 'shops waiting for you inside! Let's get things started with frequent flyer boopadoo (4), who racks up the Sony gang in Teletubbies garb. Chris Hayward (5) imaginez shovelwarez and does a fine job with it. I like how he kept the Ubisoft logo on the box. RandMan612 (15) had a few good submissions, but Kaz in his Ridge Racin' crib is just gold. Nicely done. ShinLord (16), who's had a nice stint on #TAYpics gets called up to the show this week. Squizzy (17), all I can say for you is "Bad Squizzy! Squizzy bad!" Movies and movie posters were a very popular angle; I like dyru (8), RadioactiveToy (14) and stevep7702 (18) the best. Tevious (20) invokes the Jimmy Kimmel "Unnecessary Censorship" video; knowledge of that, plus Butler's reaction, gives it a nod here. My favorite? It's up above: duck45 (7) takes a classic Internet picture and makes it scads more hilarious with the KB and Sackboy. Well done. Take a bow, folks. We're back in here tomorrow with another challenge.